When your baby's teeth begin to erupt, usually between the ages of 6 months and 1 year, he may begin to experience many side effects. Painful and swollen gums are typical of teething and the swelling and pain will usually go away once the tooth erupts. However, in certain instances, cysts or blisters on the gums might indicate that your infant is ill or has an infection. Contact your physician if you have questions about your infant's swollen gums. If your infant's gums are swollen and red and you can feel a tooth beginning to erupt underneath, it is probably normal swelling. 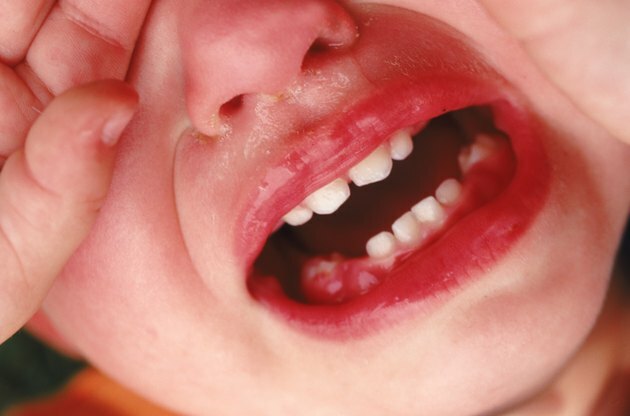 If you can't feel a tooth coming through, look at the place where your baby's gums are most swollen. The gums are typically most swollen where a tooth is about to erupt. The bottom front teeth typically come through first, then the top front teeth. Next come the teeth on either side of the front teeth, and finally the first molars and the canine teeth. If your child's gums are swelling where the next teeth should erupt, it is probably normal swelling. You can't cure the swelling but you can help to ease your infant's pain by rubbing his gums with a clean finger or a cool, clean wash cloth. Some babies prefer teething rings. The Mayo Clinic recommends that you do not freeze the teething ring because the icy ring may cause more pain for your baby. Refrigerate it or offer it at room temperature. You can also try an over the counter pain reliever as well. Do not rub your baby's gums with alcohol, however. Alcohol is not safe for your baby and it will not treat the pain or decrease the swelling. In some cases, your baby might have atypical swelling on her gums. But this swelling might not be indicative of a problem, however. For example, if you notice a blue cyst-like swelling where a tooth is about to erupt, your baby probably has an eruption hematoma, which is a bruised area where the tooth is pushing through. Red sores and swelling may be caused by the herpes virus, however. Because of the variety of causes for swelling, contact your pediatrician if you notice abnormal swelling or sores on your baby's gums. There are a few warning signs that may indicate that the swelling on your baby's gums may be related to a more serious problem. Contact your pediatrician right away if your baby's swelling is accompanied by fever, a swollen or red throat or tongue, a rash on the palms and soles of her feet, blisters or sores on the face or body, or white patches. These symptoms are linked to viral infections. If your child's tongue, throat or lips swell rapidly, she may be experiencing an allergic reaction and you should contact emergency services right away.